Hepatitis C Virions Group Portrait. The image here is 400 pixels across, the original measures 3000 x 4237 pixels. 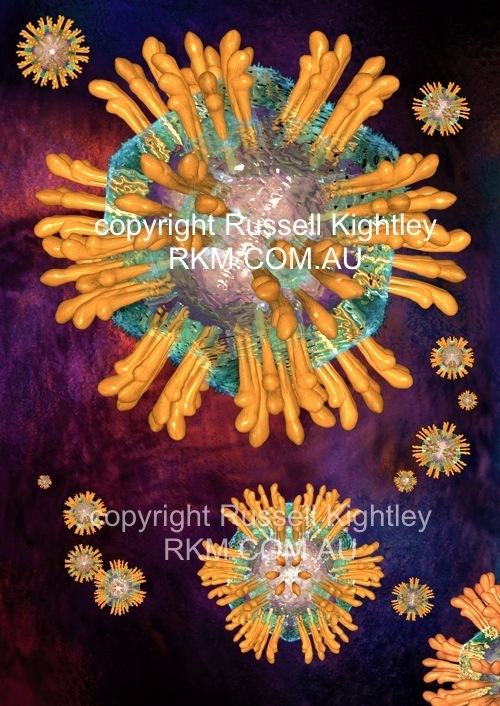 EXPLANATION OF HEPATITIS C VIRUS (HCV) GROUP IMAGE: This image shows the viral model from several different viewpoints. The orange spikes covering the surface represent the E (Envelope) Proteins. Each spike is a dimer of E1 and E2 anchored into the viral envelope (illustrated as a greenish-blue layer). This viral envelope is derived from host cell ER membrane. Below that is a purplish layer representing the core (C) proteins. In the core lies the RNA genome. It is not known whether p7 (a small protein that may hexamerise into a viroporin) is present in the virion.